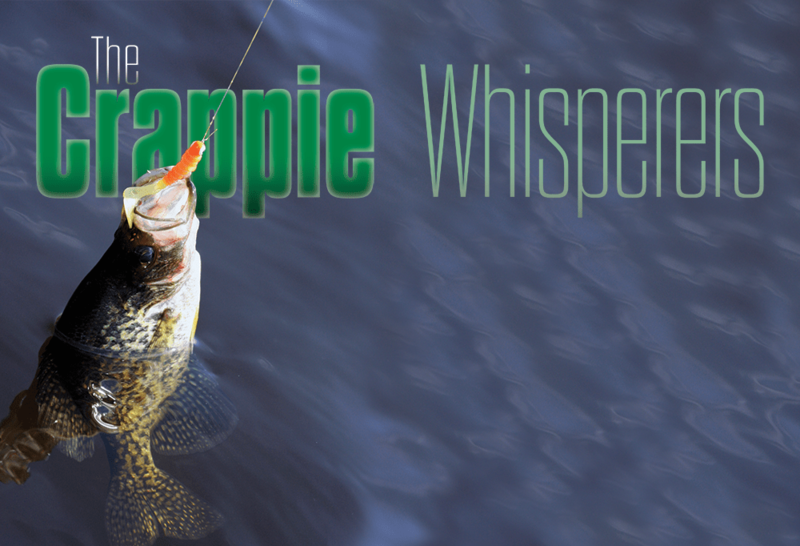 The crappie spawn is over, so where did the crappie go after leaving their shallow nests? 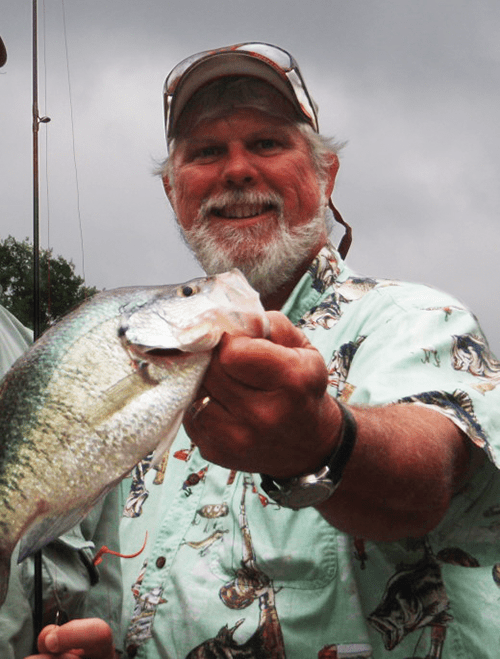 A handful of crappie fishing gurus know, and they aren’t bashful about sharing their knowledge about crappie tactics that work in a multitude of different reservoirs before, during and after the spawning season. “We fish a lot of brush piles at Sam Rayburn and Toledo Bend after the spawn and when the crappie are moving back into deep water, one of my best methods to catch them is to use a 1/32-ounce jig head with a 1/8-ounce pinch-on sinker about 12 to 14 inches on the line above it. At first, I may put a live minnow on the jig head with the hook through the minnow’s nose. I will cast it out and let it fall to the bottom. Since the sinker is heavier than the jig head, it will fall a lot faster and hit the bottom first. It sort of looks like the minnow is chasing after the sinker. It’s I call a baby Carolina rig. I let the minnow sit still at first but then jig it up and down. 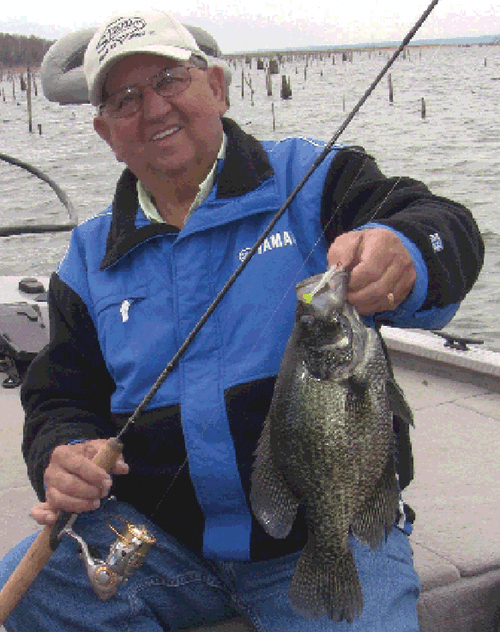 During transitions, such as in-between moving from the channels to the shallows to spawn and suspending along ledges in 10 to 12 feet or so water, Stanley loads the boat with big crappie on his Mini Wedge Runner, a close-pin type spinnerbait with a soft plastic Wedgetail Crappie Minnow. It is what Stanley calls “the world’s smallest spinnerbait” and comes with both willow leaf and Colorado type blades. 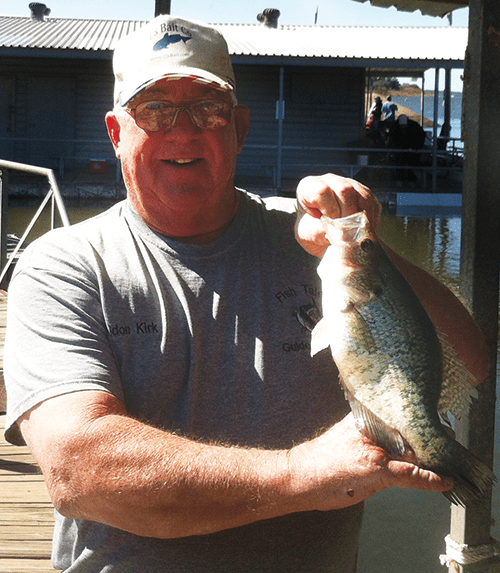 Crappie action is good year-round on Lavon but summertime is one of Kilpatrick’s favorite times to go after the paper-mouths. “Small minnows and black and blue jigs is all you need,” Kilpatrick said. “The crappie suspends one to two feet off the bottom on any structure because that’s where the coolest and most productive water will be,” he said. During the summer, Vandergriff switches from the ultra-shallow waters of spring spawning to deeper brush piles, mainly on Lake Palestine where he has guided for years. However, he doesn’t necessarily switch lures. Vandergriff targets spawning grounds such as stickups and brush along shallow shorelines, especially those in creeks. 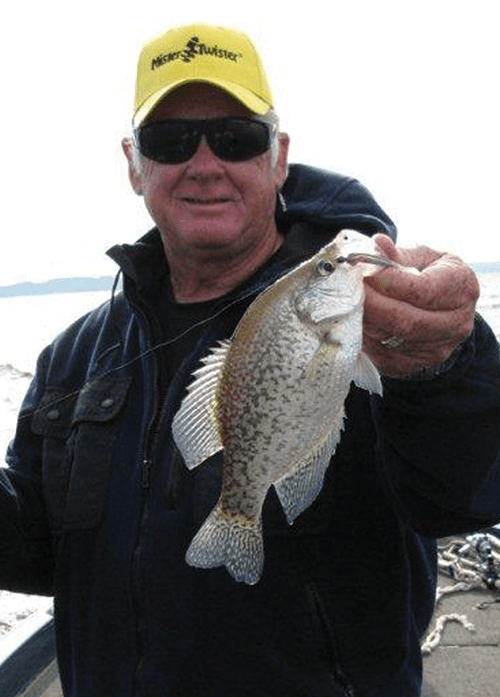 “Later in about late April or May, the crappie move out into deeper water and I use the Mr. Mino on the same slip bobber only I will slide the Bobber Stopper further up my line to fish the deeper depths, which may be 20 to 30 feet,” Vandergriff said. During mid-fall to winter when the crappie are not moving as much, Vandergriff will stay with the deepest brush piles or, as spring re-approaches will target suspended fish in the channels awaiting the water to warm once again. “As the water temperatures reach between 70 and 75 degrees, most crappie are done (spawning),” Kirk said. “Most post-spawn fish will hang around bedding areas for several days until the water temps rise a little more. Post-spawn crappie will be on isolated pieces of cover adjacent to spawning sites. I target these fish in 6-12 feet of water around structure. Curly-tail jig baits or minnows should entice them but if not try grubs. “As the water gets to 80 degrees, I look for them in deeper water, 18-30 feet, on ledges, deep brush piles or around docks,” Kirk said. “At this time, I rig a ½ to one-ounce bell sinker on the bottom of my line with two leaders coming off the main line, the first about 18 inches above the hook and the other above that. I bait one hook with a minnow and the other with a tube-tail jig. I bounce this rig off the bottom in deeper water or troll it about two-thirds down in the water where the bait fish show on my sonar unit. 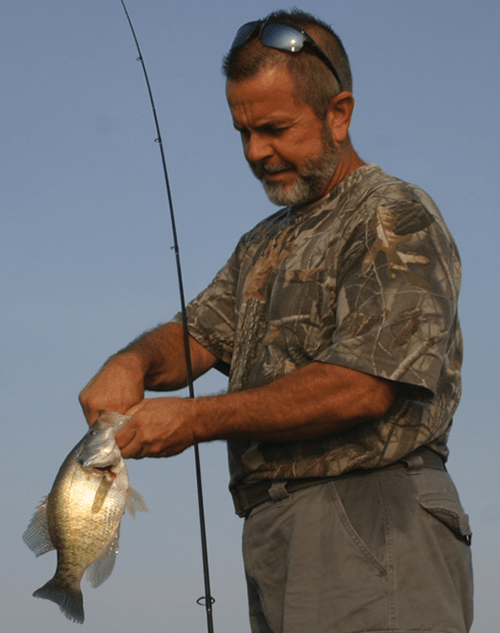 Most crappie anglers know to go ultra-shallow for spring crappie but have problems catching them during the heat of the summer because they aren’t used to changing tactics, Cox said. The creeks on the north end of Livingston _ White Rock, Harmon, Nelson, Village, Chaulk and Bedias_ all can produce outstanding catches during the summer,” Cox said. “Most have low levels and are very clear but you can overcome that by fishing the deep holes in the cut banks around lay-downs, wood and brush. Cox suggests getting on the water at first light while it is cool and then getting off before 11 a.m.